Recognized mainly for its burrs, burdock is an interesting biennial plant because it consists primarily of carbohydrates, volatile oils, plant sterols, tannins, and fatty oils. Researchers aren't sure which active ingredients in burdock root are responsible for its healing properties, but this plant may have anti-inflammatory and antibacterial effects. In fact, recent studies show that burdock contains phenolic acids, quercetin and luteolin - all are powerful antioxidants. 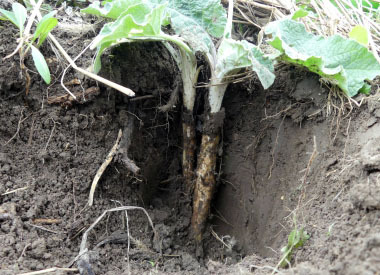 Burdock, in its first year has no stem and grows only as a basal rosette of leaves that stays close to the ground the first year and the beginning of the second. 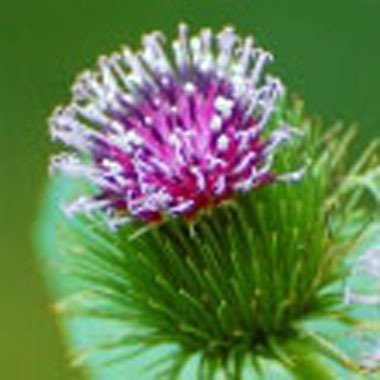 Flowers: Burdock has purple flowers on tips of prickly ball of bracts that blooms between June and October. Flower heads are 1 to 3 cm across, composed of purple disc florets surrounded by several rows of overlapping hooked bracts. Fields of Nutrition has medicinal benefits and vitamin/mineral content of Burdock. Height: This plant grows to a height of about 1 – 2 metres tall. Habitat: Burdock thrives along river banks, disturbed habitats, roadsides, vacant lots, and fields. It grows throughout North America but not in the southern regions. Edible parts: First-year roots and second-year stems can be cooked by boiling for about 20 minutes, then season to taste. Before cooking however, the stems should be peeled, and roots scrubbed in order to remove the bitter rind. Immature flower stalks may also be harvested in late spring, before flowers appear; their taste resembles that of artichoke. The Japanese have been known to eat the leaves when a plant is young and leaves are soft. For more in-depth information (e.g. nutrition, medicinal values, recipes, historical information, harvesting tips, etc.) please check out our Burdock PDF magazine.